Autumn with you on this fine May day to share a sweet and sparkly little girl's birthday card featuring our new Cupcake Stand die. This amazingly intricate die is a whopping 4.5" high! Tutti Designs dies are always large enough to make big impact without much work. This die certainly does that! I wanted extra oomph so I layered silver and hot pink glitterstock for a multi-matted card. I hated to waste all of that silver card in my matting, so I cut the center out and saved for another die cutting session! To do that, I simply lined up my paper half an inch past the cut area and cut all four sides, stopping at the half inch mark on my ruler. 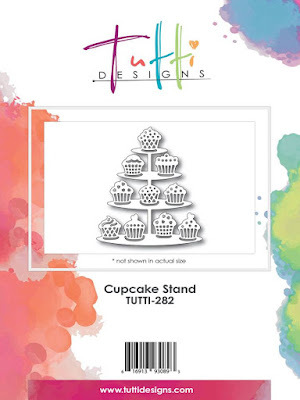 Purchase your Cupcake Stand die today HERE! Who doesn't like something 'sparkly' on their birthday! LOL This is fabulous Autumn ... great job and awesome inspiration! Yup! Just perfect for a little girls (or even a big girl's) birthday! Love that glitter and the die is a wonderful addition to the arsenal! Thank you for the inspiration! Hugs!